Discover a stylish selection of furniture, home décor, unique gifts and all the accessories at Picket Fences. Picket Fences offers access to anything you could possibly need or want for your home. Whether it is a decorating or redecorating project, Picket Fences has all the latest trends & styles. We bring you the pieces that can transform your home. Add a stately piece from our furniture collection. Choose from a variety of high end furniture makers to handmade furniture and rustic tables. 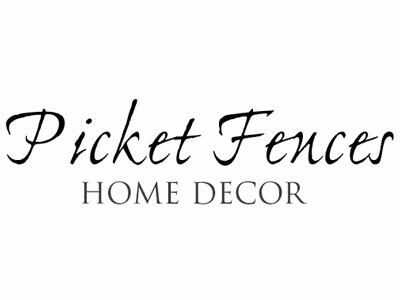 Picket Fences has the unique accent pieces you are looking for to make your house your home. Picket Fences now offers fabulous patio furniture and patio accessories! Retouch the room with some new or added rugs, framed art or accessories. Picket Fences offers a wide variety of Sid Dickens, Consuela crosses and bags, Round Top items, and Vera Bradley accessories. Light up a dim corner with a beautiful lamp; or candles. Always ready with a large variety of Tyler candles, Trapp candles, and Root candles. Create a grand entrance to your home with our floral designs. Bring life into a room with a fine custom silk tree or a magnificent custom silk floral arrangement. Picket Fences has a renowned silk floral artist who also designs for celebrities. Our silk floral artist can design a custom arrangement for you. We also offer a huge selection of high end silk stems and floral stems. In addition to your home needs, we also offer special gift ideas. We have a fabulous collection of Chamilia jewelry, body products by Thymes, Caldrea lotions, Baby gifts, delicious Texas Salsas and much more. Unique gifts to show that special someone you care! Come by and take a look. Picket Fences will provide you with exceptional decorating solutions & unique gifts.